Supreme Court Protects and Dishonors Cross | Byron Howell Ministries, Inc.
Today, April 28, 2010, the United States Supreme Court ruled on a case concerning a large cross that sits on federal land. The Veterans of Foreign Wars first erected the cross in 1934 to memorialize the fallen soldiers of World War I. I will not bore you with a lengthy legal analysis. They did not rule that it can stay forever. In a 19 page opinion Justice Kennedy basically said it can stay for now, pending potential further review of other laws by a lower court. You would probably need legal training to completely understand the rationale in Justice Kennedy’s opinion. But you would only need an ounce of common sense to quickly see the whole situation is ridiculous and pathetic and (I believe) deplorable before God. Do not be fooled. If the ACLU has their way they will go one by one through every piece of public land and tear out anything that even remotely appears religious. Today they lost, but not big. I find the opinion by Justice Kennedy, which allows the cross to remain, most disheartening. I would prefer him to say, “Christianity is the only true religion and we hope our fallen go to Heaven and because of that hope we place a cross in their honor. Now shut up and go find a real job.” But of course he won’t say that. How about, “That monument has stood for over 75 years, it reflects the religious views of millions of Americans, and the government can put a cross on public land if it wants to.” He won’t say that either. Justice Kennedy needs 19 pages because he must work within the horrible legal framework concerning such issues. He has to meander through standing, other acts of congress, and hypothetical reasonable observers. He ends by essentially deciding the case on procedural issues alone. In short, because Congress passed a law trading for value the land to the Veterans of Foreign Wars, and therefore getting the monument off of federal land, that law must be completely reviewed by the lower court. Until that review takes place, and the law determined to violate the Constitution, the cross can stay. Well thank you for protecting our cross Justice Kennedy. To keep the cross in place Justice Kennedy works to completely remove its true meaning and religious significance. I’m not saying he wants to do that (I have no idea about his religious beliefs). But he has to because he wants to protect it. In this country, to display or protect anything on public land we have to strip it (as much as possible) of its religious significance. The less religion the better, and the safer. Don’t you see? The ACLU and other anti-religion forces have already won this war. The establishment of this analytical framework was the victory. Every single religious symbol on public land must be shown to have other predominate significance, and to have been erected for a secular purpose. Even the judges who want the crosses to stay argue along those lines. Justice Kennedy, today’s champion of the cross, had to emphasize its secular meanings. Now the cross is a memorial for thousands of other graves and countless heroic acts. I thought it was a memorial for one heroic act and one other grave. I thought we put the cross on graves because of the One Who conquered death, hell and the grave. 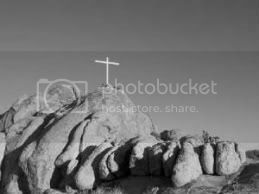 I thought we put the cross on graves to symbolize that because Jesus died we can live. I guess not. It’s terrible, terrible, terrible. President Obama talked about fundamentally changing this Nation, and I think that’s exactly what we need to do. I’m not sure I’m in for all of his ideas about change, but I have a few of my own. We need to completely redefine our sacred separation of church and state. We need to change it and get rid of it. If you really believe in Christianity then you should really want your government to support it. Don’t worry about the potential negatives, focus on the unimaginable positives. When our Nation starts honoring the One True God then God will honor our Nation. If our Nation continues despising Christianity then our Nation will become contemptible to God (1 Samuel 2:30). Frankly, I can’t stand it when Christians support the separation of church and state when promoting the removal of Christianity from the public sphere. Can you tell me right now God approves of that or God wants that? That is insanity! God wants His Word and His Name glorified in all the world, and definitely the USA. To those who seek the complete removal of Christianity from everything public - Our Nation has, on public land, many landmarks of religious significance containing religious symbols. You might remove them, but God will fight with you because of them. They have a Redeemer, One Who loves them and honors them. When you dishonor our Nation’s Christian heritage, and the related monuments, you dishonor God. Be careful you do not fight against God. It’s time we honor God and what God honors. It’s time we promote Christianity in all facets of life. God will plead our cause with us. It’s time we pray for God to be glorified in this Nation. It’s time we establish a new legal framework and set up new monuments, for our children and theirs. It’s time the USA officially honors God and His religion.